Your Marketing University It's Like A Marketing Degree Without The B.S. Ever get a little freaked out about going to a networking event? Do you get nervous walking in the door some place where you don’t know everyone? If so, chances are you’re an introvert. When I first started my business I had no clue what I was doing and I surely didn’t know how to network with other business owners. Luckily, you don’t have to and there’s a few things I learned early on that made a huge impact on how I dealt with my introvert nature and networking. As introverts, we’re not too fond of crowds. I’ve been in crowds that were downright overwhelming. Anxiety attack and all. One way I’ve found to really help with this is to show up to the event early. Be one of the first people in the door. This gives you a huge advantage to talk to people as they enter the room and before they get into a conversation with a big group. It’s pretty much a given that no matter how uncomfortable you are there’s likely someone else who’s just as or even more scared than you. That’s the wallflower… the person sitting against the wall or sitting at a table by themselves looking like they want to talk to someone but just don’t know how to. Go introduce yourself to that person first. Chances are, it will make their day and they will remember you forever because of it. Once you get a little more comfortable you can then really become their hero and introduce them to someone else at the event. One thing we tend to have issues with as introverts is the actual conversation. It’s pretty simple, we just aren’t as good at small talk as others. 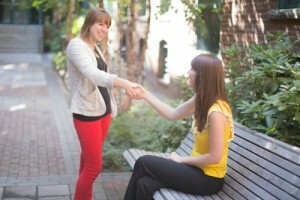 Want a great way to make it easier on yourself and leave a lasting impression with the person you’re talking to as well? Ask a lot of questions. Make it about them. Let them know you want to know more about them and who they are. Those questions should easily be able to get you started and give them a chance to tell their story. The best part about this is people really do want to share what they do. It is human nature to want to talk about themselves. So, let them! You’ll get to know a lot about them which is great to know if they might be a good prospect or not and they will remember you as that awesome listener! If you’re an introvert, run with these three tips. They’ve served me well over the years and have helped me grow my businesses to amazing heights. All while everyone thinks I’m a great conversationalist. Little do they know that I used to be terrified of talking to people. In this presentation you will learn how to simplify all of the “Marketing Voodoo” into an easy to follow, step-by-step roadmap for you & your team to explode your sales and build the business you dreamed about when you started. Grab Your Copy Of Marketing Tidbits! If you want a no-nonsense book to give you dozens (50 to be exact) of marketing tactics and actions you can do immediately without having to spend a lot of time and money then you’ll want this book! Each chapter is designed to stand on it’s own and be something you can immediately use in your business within a few minutes. No fluff, no BS, co complicated expensive strategies here. Just pure simple elegant tried and true marketing tidbits. The Marketing Tidbits book is live on Amazon now! Go grab your copy today and you’ll get free bonuses just for buying it. Ely Delaney is a dad, Best Selling author, speaker, marketing consultant, Infusionsoft Certified Partner and Founder/CEO of Your Marketing University. His goal is to teach marketing in a simple easy to understand format businesses can use to help gain marketing ideas & market their businesses to boost sales. Learn how to create your step by step process to building an automated process that will keep you in contact with customers and prospects with a "set it and forget it" system. Claim your copy of my free "Networking Follow Up Blueprint" to find out. © 2007-Your Marketing University A Site From Purple Knight Marketing, LLC.